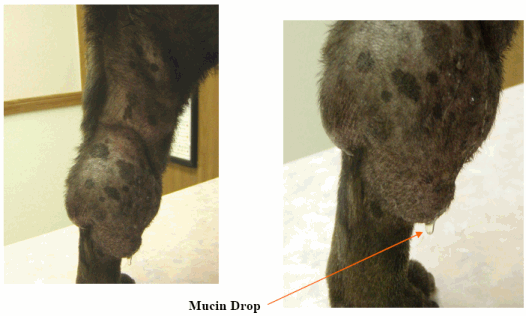 I’m seeing a condition in a few Shar-Pei in which the hocks swell to the point that mucin (hyaluronan) starts leaking out from under the skin (through the skin?). Usually these are dogs with excessive wrinkles and overdone heads. Some of the dogs seem to be licking or chewing on their hocks and may be causing excessive mucin accumulation related to inflammation. I’m not sure if they are traumatizing the hocks enough to cause the leakage or if the pressure from the mucin causes the leaking and the dogs are cleaning the area. In my area (Chicago) it appears associated with our hay fever allergy season. Some of these dogs do “deflate” with antihistamines such as diphenhydramine (Benadryl), hydroxyzine, or chorphenirimine while others need to be on prednisolone. Some of the dogs with this condition were mistakenly thought to have urinary incontinence or bladder infections. The mucin doesn’t have any odor to it and is usually in smaller amounts.